Students step out on the world stage through Jr. Model U.N. Beyond the Borders: The Global Smarts Mentoring Program transports young minds from North Philadelphia to the world stage. Do you know the difference between a preambulatory clause and an operative clause? Or why China abstained from a vote condemning Russia’s actions in Crimea at a recent session of the U.N.? How about what to do when someone in the room signals for “decorum”? 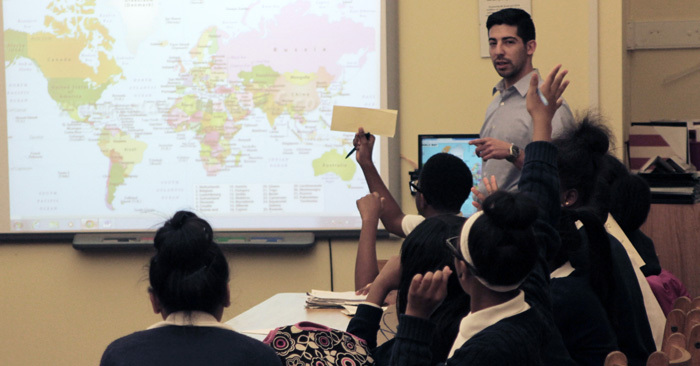 Thanks to the Global Smarts Mentoring Program from the World Affairs Council of Philadelphia, 16 of Gesu’s 7th graders—or should we say the Cuban and Italian delegations to the Jr. Model United Nations—have mastered this and much more. And thus begins the weekly session in the Gesu library, map on the smartboard, the Cuban and Italian delegations sitting at long tables facing each other. The students answer questions about geography, get quizzed on current events, and learn the meaning of the word “veto.” Then they spend some time on packets addressing one of the four topics they’ve been assigned to tackle at the Jr. Model U.N. Final Conference in May: the refugee crisis in Syria, gender equality and economic development, the global arms trade, and infectious diseases. Sean Shtofman and Jade Marie Nesbitt, the group’s “mentors,” circulate through the room, answering questions and providing encouragement. They are among a dozen college and graduate students recruited and trained by the World Affairs Council to deliver the specially designed curriculum in six city schools this year. The mentors receive course credit for their participation, and their role includes serving as living advertisements for the importance of getting a college degree. The students engage in a few more exercises before packing up for the day. After school, a few stay behind to use the school’s computers to do further research. Others will finish their work at home over the next week. And rightfully so. Even the mentors themselves have fascinating backgrounds. Shtofman, a second year grad student at Arcadia University, majors in international peace and conflict resolution. He was in Ukraine a month before the current crisis erupted, speaks five languages, and plans to take the Foreign Services Exam after finishing his degree. Jade Marie Nesbitt is a junior at Saint Joseph’s University majoring in psychology and minoring in Spanish and Latin studies. She plans to pursue a doctorate in psychology with a focus on depression in children. Places like Connecticut might as well be as far away as Cambodia for many inner-city students, and topics like international affairs, geography, or how to negotiate a compromise can remain elusive. They need all the help they can get catching up on things their suburban peers absorb on family vacations or at the dinner table. At their annual Jr. Model U.N. conference, the World Affairs Council observed some of these knowledge and skills gaps. The city students just couldn’t debate or participate at the same level as their suburban peers. “A lot of the schools in Philadelphia just didn’t have the resources,” explains Dana Devon, vice president for education for the World Affairs Council. To address the disparity, the World Affairs Council piloted the Global Smarts Mentoring Program last year. The program’s concrete and engaging approach gives city students the knowledge and skills needed to effectively and confidently participate in the Jr. Model U.N. The program worked, and the Council obtained funding to double it this year. Gesu School is lucky to be part of the expansion thanks to an introduction made by Gesu volunteer Margaret Lonzetta. “It’s important to give the kids the idea that there is a world outside the neighborhood and beyond Philadelphia,” says Lonzetta, who recently facilitated a letter exchange between the 4th grade boys and some students in India. “I’m just really proud of my kids and I’m glad that they learned so much,” says Nesbitt, who admits she’ll be sad when the program is over. She won’t be the only one. Thank you to the World Affairs Council for helping the next generation learn to think creatively and work collaboratively toward solutions for the world’s problems! 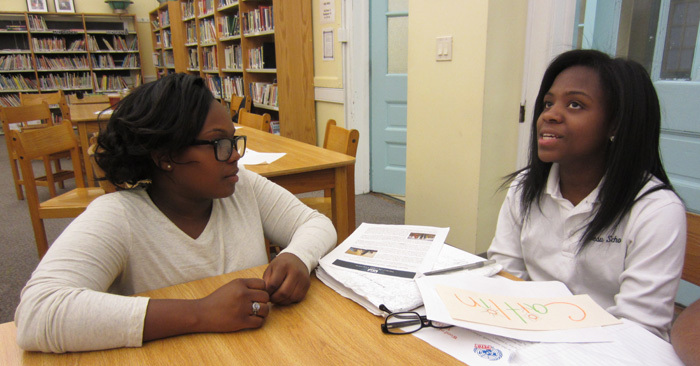 Jade Marie Nesbitt of Saint Joseph’s University works with 7th grader Caitlin in one of the weekly Global Smarts Mentoring Program sessions provided by the World Affairs Council. Sean Shtofman of Arcadia University reviews U.N. protocols, geography and current events. The program introduces the students to a new way of thinking and a brand new world beyond the boundaries of North Philadelphia.